"Fun activity that encourages pattern recognition!" Review: "I bought and used these puppet kits for my 3.5 year old son. Also gave a set to a friend's 2 year old daughter as a birthday gift. We used teh Discount School Supply brand glue sticks. It worked great! My son enjoys these and I enjoy making them with him. He needs some guidance, but he is getting better at putting the pattern together the more we do. Each puppet comes individually packaged with all the pieces and a picture of the final product for instructions. They are ver colorful and tidy! I will definitely buy more for my children and others." A puppet show? It's in the bag with this kit! Paper bags and foam pieces make 12 different, adorable animal puppets. 9 5/8"H x 5"W x 3 1/4"D. Instructions included; glue sold separately. Indestructibles™ series is made for baby to grab, chew, pull, bend, and hang on to. Made from 100% washable material that won't tear, rip, or puncture. Eye-catching photos are bright and colorful and pages contain no words, allowing you to create your own stories. Design big! Large, easy-to-manipulate tile pieces help develop fine motor skills, eye-hand coordination and encourage creative thinking. Snap tiles together to form substantial mosaics on a table or floor. Introduce little ones to their very first puppets. Our exclusive machine washable Happy Hands Farm Animal Puppets are made especially for a toddler's hands and feature enchanting detail. Have a joyous, cozy day on the farm exploring imaginative play. Hurry, this sale only lasts one week! 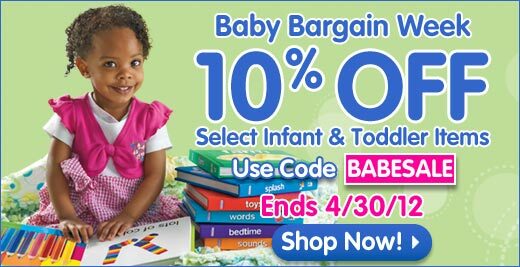 Shop today and SAVE BIG on top quality infant & toddler products like these for your home, classroom or learning center. Remember, Discount School Supply has the 110% Lowest Price Guarantee on Arts and Crafts, Furniture, Manipulatives, Curriculum Supplements, Active Play items, Dramatic Play products, NEW Jan-San products and more!